Working across a wide range of media, Lothar Hempel stages elaborate theatrical possibilities, placing the viewer as an autonomous character engaging in his constructed dramas according to their free will. Stemming from an interest in value and identification systems, Hempel’s paintings exist as potential casts for his interactive dilemmas. In this series of paintings, Hempel designs a parade of figures: identical in stance, each character is defined by their aesthetic properties; painting itself becoming an extension of persona, ideology and storytelling. In Golden Triangle, Hempel’s figure is a tragicomic muse: his face painted as a grotesque Venetian mask, and is sinister in uniform, adorned with a rainbow coloured tutu. Hempel frames his perverse presence with designer elegance; harlequin tiles and dead black-green buds suggest both a dandyism and courtly intrigue. Underlying themes of contemporary politic are neutralised for the viewer, creating not a portrait, but an instance of ethical quandary. Following the format of ancient friezes, Lothar Hempel’s figures play out scenes of high drama from their stiff and stylised positions. In Kindl, Hempel paints a statuesque woman, a prototype heroine resplendid in diva-esque fashion. Hempel’s simply rendered background is suggestive of minimal theatre sets and allows homely formalism to give way to urban mystery. Drawn in hieroglyphic profile, Hempel humorously focuses on her eye; the only vivid indicator of explicit action, he paints it with the dramatic trepidation of crime film posters. “Consideration of moral, ideological and ethical issues, are my central motifs, and are delivered by questioning the concept of the self.” Lothar Hempel explains. “The self here is fluid and dynamic, a social metaphor. It doesn't have a beginning or an end.” Taking fractured identity as a bi-product of modernity, Hempel constructs his portraits with a sense of fleeting transience. Painted on paper, they are figures of fancy; two dimensional characterisations, their similar format making them interchangeable props. 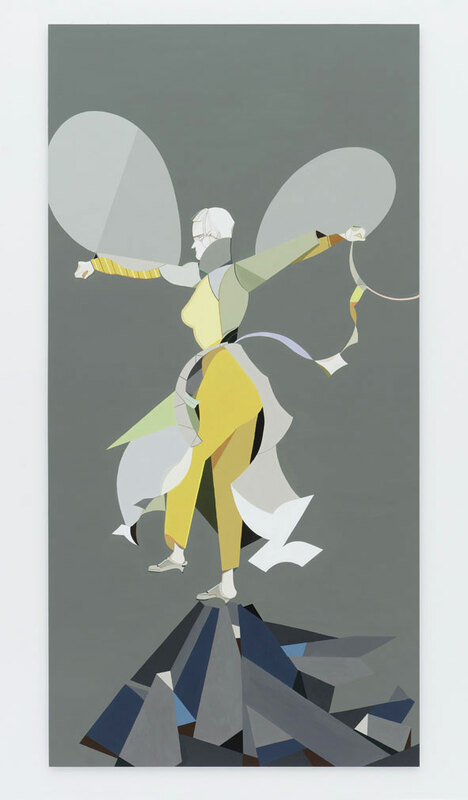 In Kreuzberg Night, his figure operates as a formalist construction, a blank projection of contours and colour-fields, their attributes and symbolism readily appropriated for viewer self-identification and imagination. Drawing from the timeless morality of myth, Lothar Hempel pictures the heroic Jason as a god-like form, a portent of tragedy. Taking reference from ancient Greek theatre, Hempel’s figures rely on a minimum action and presentation in order to maximise the audience’s imagination and response. Characters’ attributes are defined solely by their costumes, their emotions by sculptural masks. His figures’ stylised stance and armless torsos restrain overt gestures of action, their ‘storytelling’ unfolds from symbolic and psychological interpretation rather than physical illustration. In Jason, Hempel paints his figure standing over a two-toned ground, walking from white to black: a climatic moment foretelling fatal misadventure. In Medea, Lothar Hempel paints Jason’s wicked counterpart as a ruthless femme-fatale. Her fractured and calculating state of mind is echoed through the angular patterns and sharp strata of her dress and ground. Bold colours and geometric shapes allude to strength of character; her face a contrast of soft amoeba-like blotches, relating a feminine humanity and diseased corruption. Placed on a steely grey backdrop, Hempel gives this figure a supernatural dynamism, the wrath of a woman scorned echoing in timeless and placeless dimension. Through a simplified and stylistic form of painting, Hempel creates a sense of a theatrical charade. 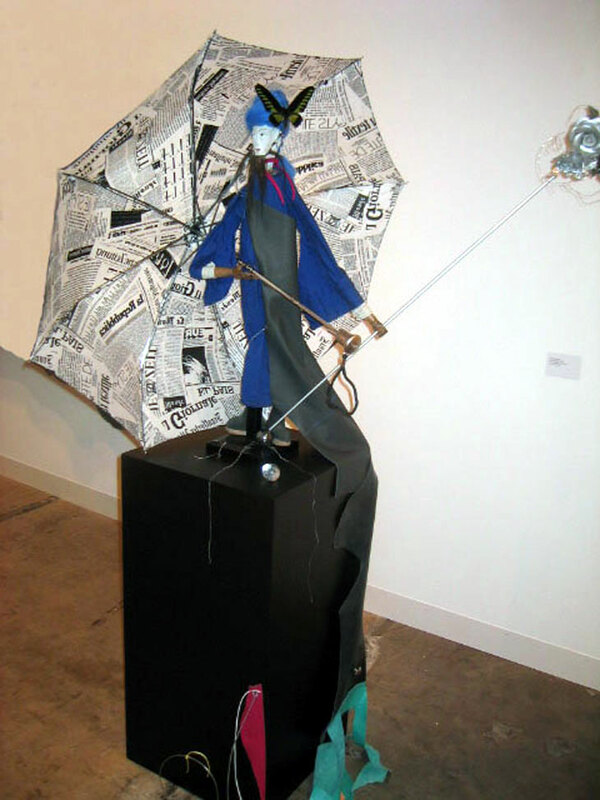 His figures are suggested as impostors, knowing hypocrites or deceptive pawns of unseen and elaborate fictions. Hempel uses painting as a tool of illusion. His dream-like and surreal forms don’t pretend a reality, but constantly reinforce their staged-ness. Reminiscent of Bertolt Brecht’s ‘epic theatre’, Hempel’s formalist compositions and puppet-like figures don’t provoke emotional engagement, but rather the viewer’s detached critical reaction to the presented narrative. In portraits such as Richard Wright, Hempel sets up scenes of plausible mystery and adventure as analogies of the viewer’s self-reflection and moral judgement. Presented as both sculpture and theatrical maquette, Lothar Hempel’s Morning Rain offers a sentiment of naïve elegance. Constructed from simple craft media such as fabric and newspaper, Hempel draws from the enchantment of imagination, converting everyday materials into a fanciful puppet theatre. Consciously exposing the process of his making, Hempel’s figure makes no pretence to illusion. It’s interpretation as fictional scene, fragile museum piece, exotic artefact, or simply formalist intrigue is openly offered for viewer’s participation in Hempel’s suggested fantasy. Delineated through whimsical colours and shapes, Lothar Hempel’s Butterfly presents a scene explicit in its fabrication. Conceived as if it were collage, Hempel’s painting is suspended in a crafted world of playful make believe, its simplified design conveying a sense of theatrical magic. Picturing a pixie balancing on an abstracted mountain, Hempel freezes narrative movement in a moment of static expectancy. Drawing equally from fairytale illustration and modern formalism, Hempel exposes the illusion of escapism, beckoning the viewer to examine their own motives and rationale.